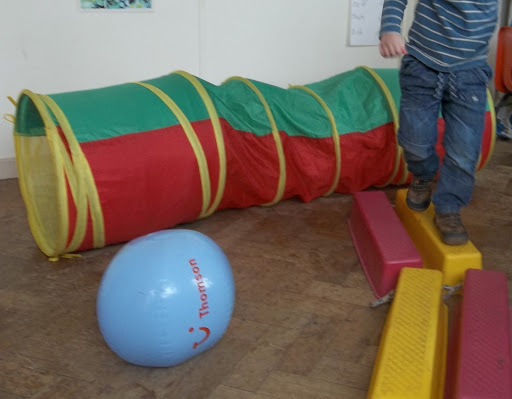 After the Christmas break the Daisy Chain children enjoyed a range of activities based on dinosaurs. We counted them, measured them drew around them and sorted them by size. Super Heroes then became our focus and we were very excited to be visited by Batman. 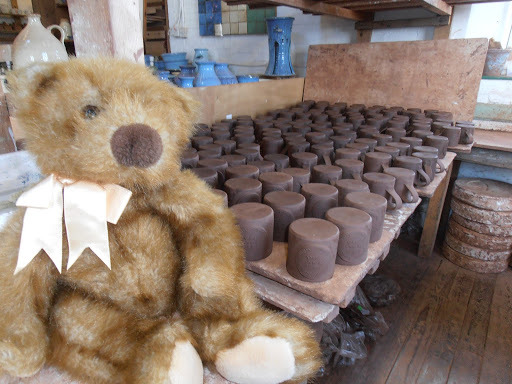 He spent an hour chatting to the children. Batman patiently answered all their questions. 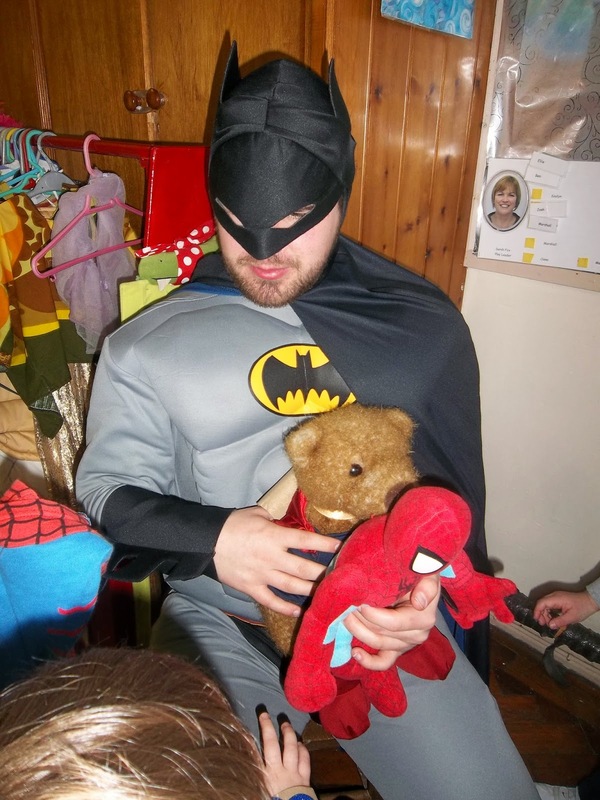 The children wanted to know where he lived , could he fly, was he a boy, why did he have a beard (because it is cold flying in the Bat Wing in the winter!) . Also what the different parts of his armour on his suit did. 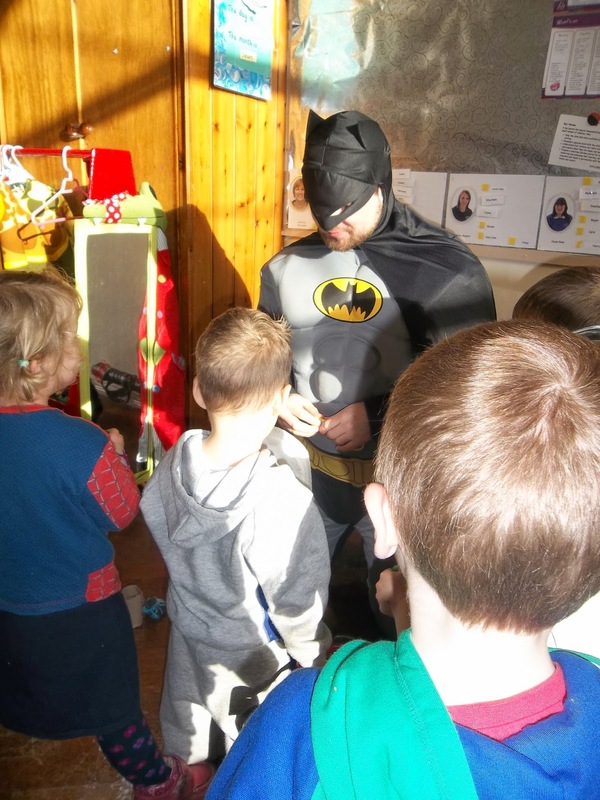 The children were making power bracelets from cardboard that day and rushed to show Batman their creations. We continued the term thinking about our homes and families.We thought about how much we love our Mummies and Daddies,made boxes of hugs for them and made cards. We drew pictures of ourselves and our families and thought about how we were babies and how we have grown. 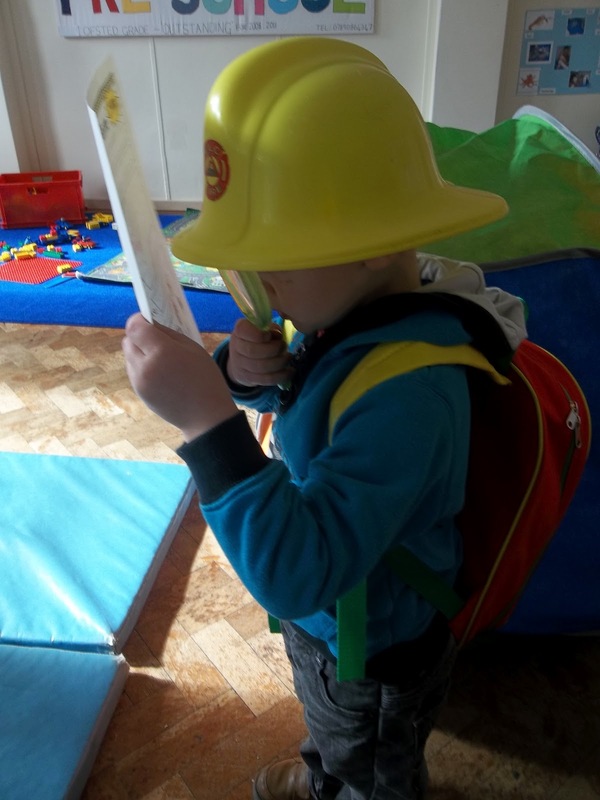 As children all enjoy being read to we focussed our learning on ‘Books’ wanting to introduce them to the idea that books not only contained stories but other types of information too,. We used recipie books to cook. Looked at fact books to find out about butterflies, made bridges for the 3 Billy Goats Gruff to cross the river. 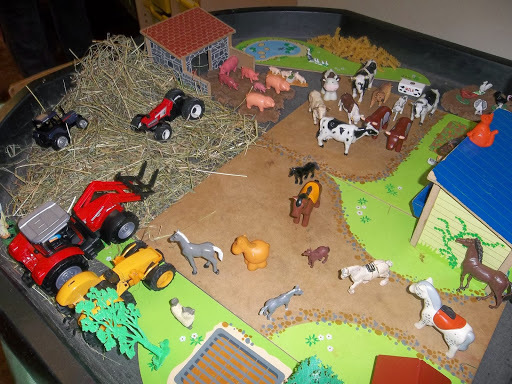 To encourage the children’s expressive language and imaginative play (very important for later story writing skills when they are at school) we had a whole day when the all the settings small world toys were set out. Easter was soon upon us and lots of Easter themed activities were provided. 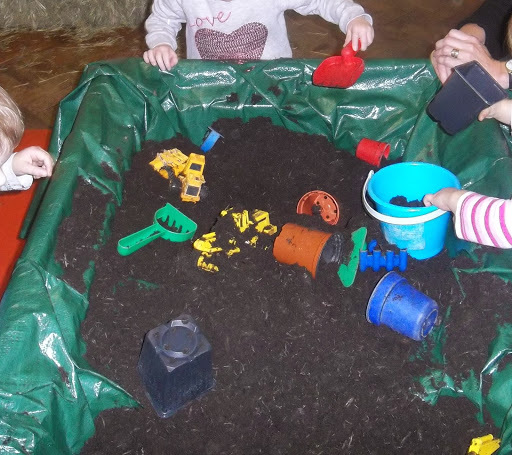 We sponge printed Easter patterns, turned our hand prints into flowers, matched patterns on eggs and the role play area was a rabbit warren (with a few chicks and hens). The Easter Bonnet Parade was amazing with no two hats alike. 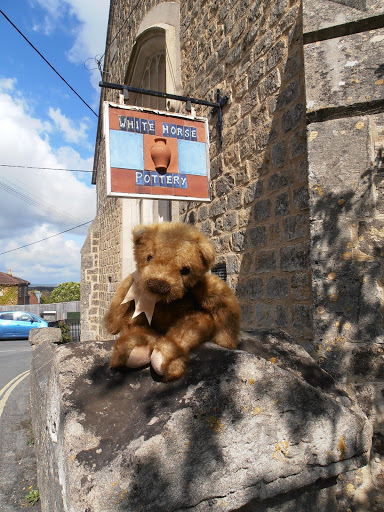 Our fete afterwards was well supported and the money we raised this year was donated to the charity Dorothy House. 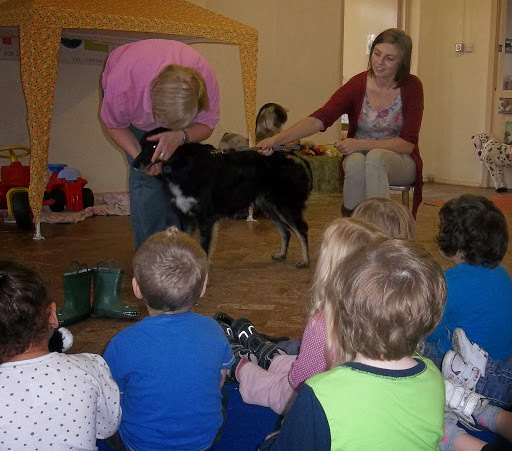 During the Autumn Term children at Daisy Chain Learnt about the Farm. 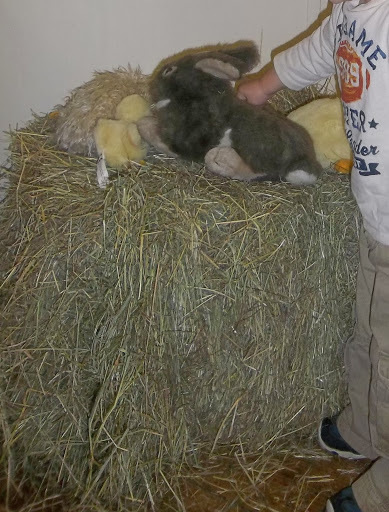 There were lots of different activities to try and the main play room was transformed into a farm yard with large toy animals The sit and ride tractors and a bale of hay. 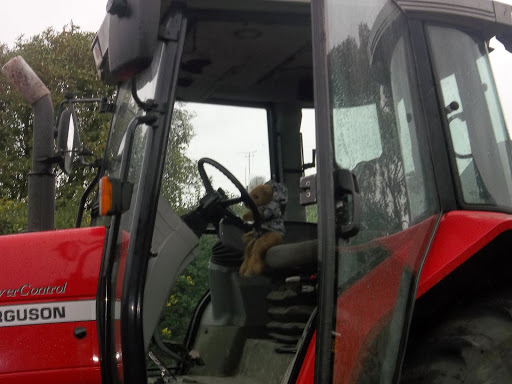 Even Ginger Bear got the chance to sit in the tractor. 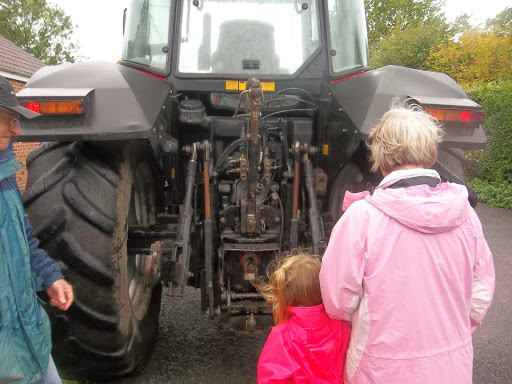 Local farmer Brian brought his real tractor for us to look at and the children had a chance to sit in the cab. One family brought their chicken in for us to see and Sarah Fox brought her dog called Fly which the children were allowed to pat if they wanted to and washed their hands afterwards. Later in the term we thought about Being Healthy. We talked about eating healthy food , taking exercise, and keeping ourselves clean, particularly washing hands cleaning our teeth and covering our coughs (with our elbow so the cough and sneeze germs don’t get on our hands). The garden was re turfed with a kind donation and the money raised from our sales and raffles went towards new equipment for the garden. 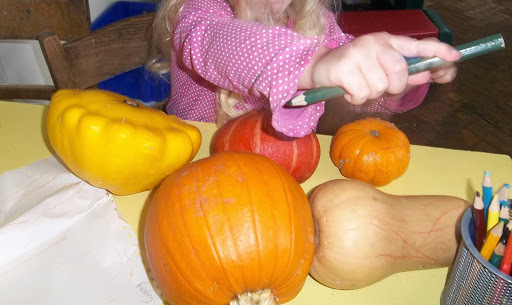 We changed activities to learn about Autumn, making bird feeders, hedgehogs (practising our scissor skills snipping straws for their spines), printing with leaves and making rubbings with leaves before starting our Christmas activities in December. Our Nativity Play was as popular as ever.Especially the story when told as the children remembered (Mary was visited by an angel called ‘Angel Delight’). The older children enjoyed walking to Westbury Infant School to see the Nativity Plays. 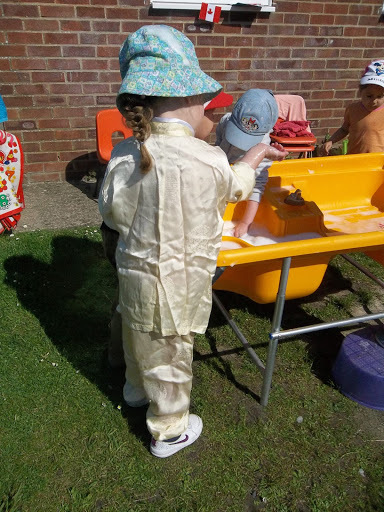 The children had been very interested in our ‘Around the World ‘ day at the beginning of June so we decided to revisit the topic and spend longer introducing them to other countries. We had lots of activities to use as a starting points and the children were interested in the large map of the world wanting to know where they lived. We talked about Russia and compared the sizes and drew around a set of Russian nesting dolls. We made pictures using glue and sand and made pyramid pictures from rectangles of paper whist talking about deserts and Egypt. Australia was introduced through it’s varied wildlife and the children made vegemite sandwiches. The children used their mathematical skills to build tall towers and compare sizes as they looked at pictures of skyscrapers in New York. We made red fans from China and made the South African flag and designed flags of our own. 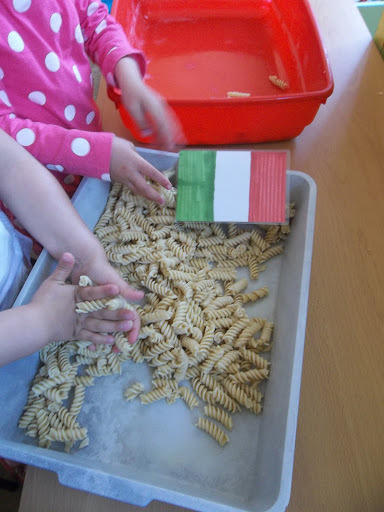 Italy was introduced as we explored painting with dry and cooked pasta comparing the different marks we made. 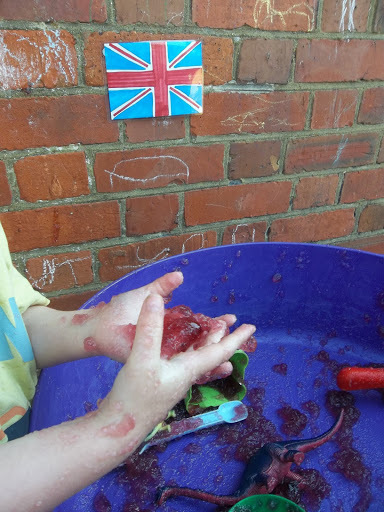 The children also explored fish from around the world as a sea cod, trout and squid was available for them to touch (with gloves on). Our summer fete was a great success contributing £150 towards the garden improvements. 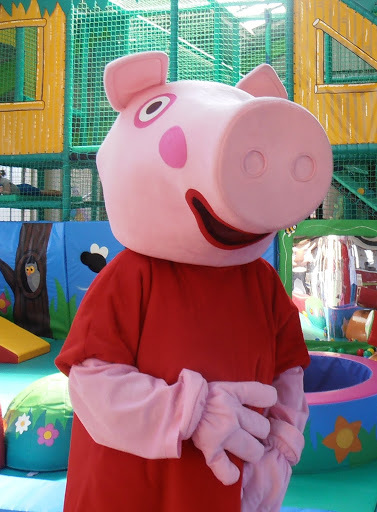 We said goodbye to our school leavers who enjoyed their farewell party at Kalula Kids soft play and we were excited to meet Peppa Pig who popped in to see us. Daisy Chain restarts on Wed 4th September2013. At the beginning of June we celebrated Universal Children’s Day. This is celebrated around the world. Some countries celebrate at different times of the year. Slavonic countries celebrate on 1st June, other countries choose 20th November. Children’s Day began in 1954 originally to protect children working in dangerous circumstances and the rights of children to an education. 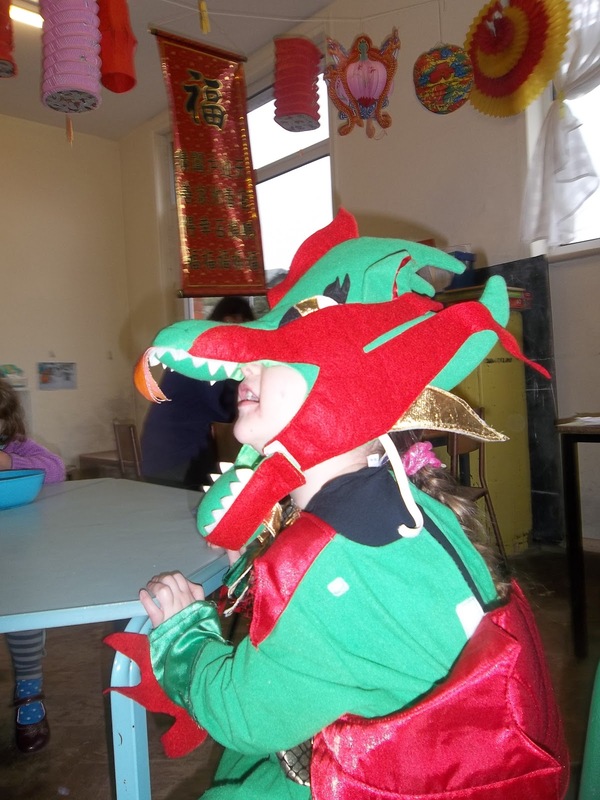 The children’s activities for our ‘Children’s day’ were based on the theme of ‘Around the World in a day’. 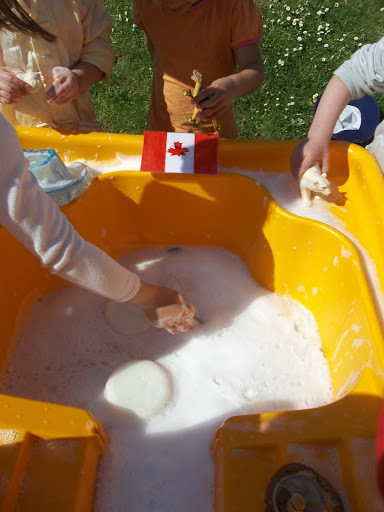 We played with cooked pasta (Italy), dry coloured rice (India), had ice and snow in the water tray with Arctic animals (Canada), We had paper dolls in natinal costume (Turkey), colouring sheets of national dress and folk tales (Poland). 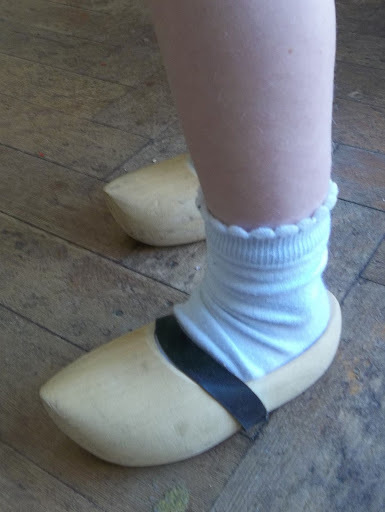 We dressed up in Chinese clothes, played with desert and jungle animals (Africa) and sorted wooden clogs by size and tried them on (noisily) from the Netherlands. From Britiain we explored wobbly sticky jelly. The week before Fathers Day Daddies , Grandad’s, Uncles and friends came in to play with the children. They were in great demand from all the children and read stories, played cars, played with the play dough and joined in with the daily activities. 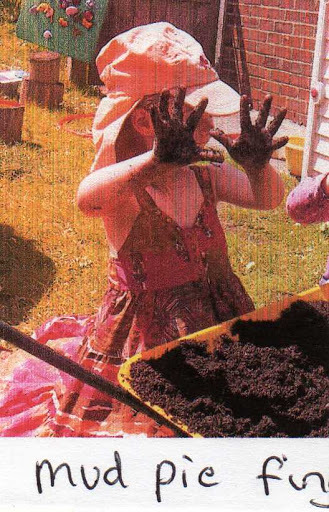 Some Daddies made clay bugs, others made finger printed lady birds etc depending on which day they came in to play. The focus at the time being ‘Mini Beasts’. 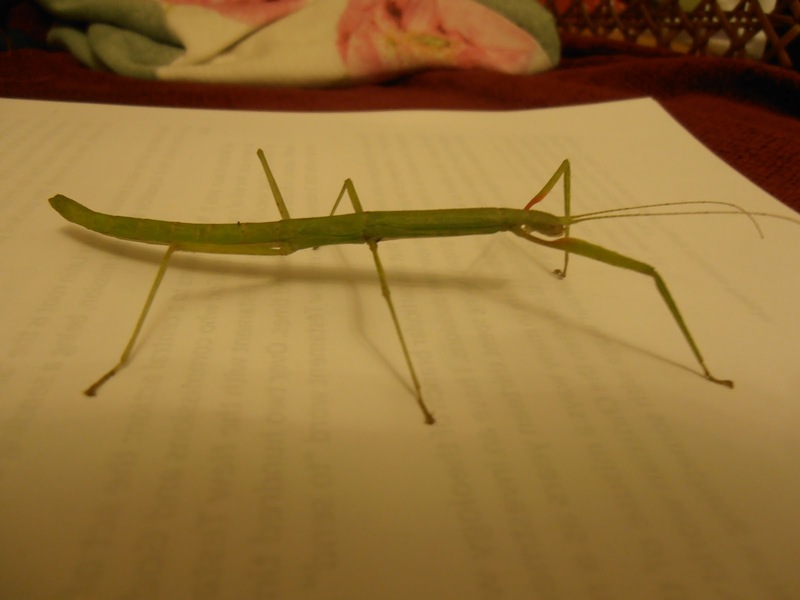 Everone found the mini beast topic interesting, we looked at snails and slugs and Sharon brought in her stick insects. 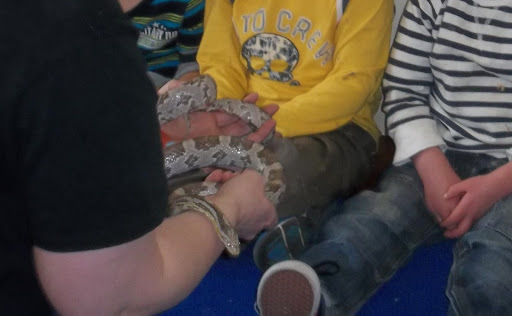 Some children were keen to hold them, others preferred to look from a distance. We made glittery spider’s webs, drew around buttons to make spots on ladybirds, counted ladybirds and tried to match number to ammount by placing 3 ladybirds on number 3 etc. 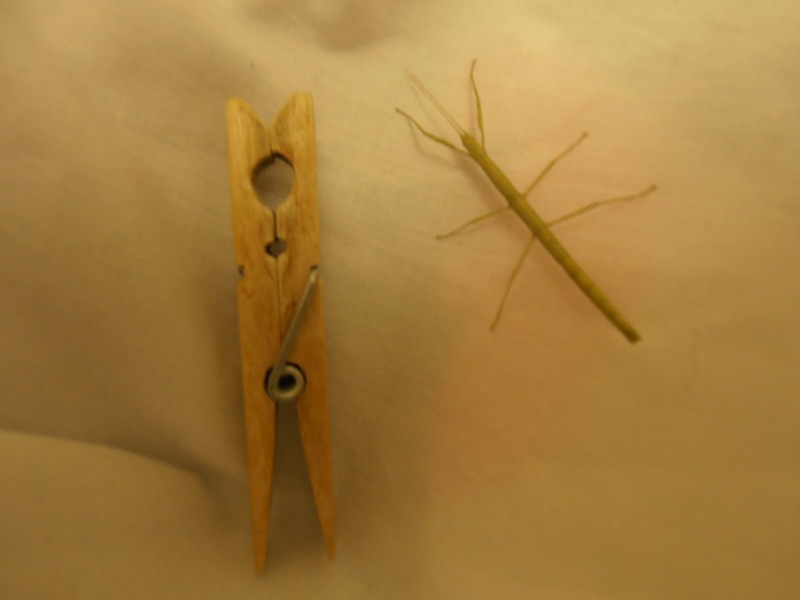 and we also used twigs to make stick insect pictures. 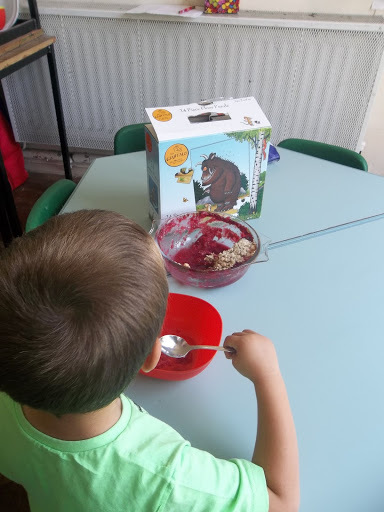 Several children love the Gruffalo story so we focussed activities on this book for a week. 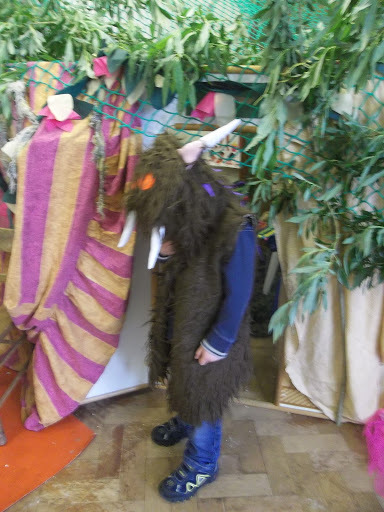 The role play area was turned into the Gruffalo’s cave , resources were provided for dressing up as characters from the story , Sarah bought lots of puppets, jigsaws and games for us to use based on the book. We enjoyed exploring all kinds of Easter themed activities. 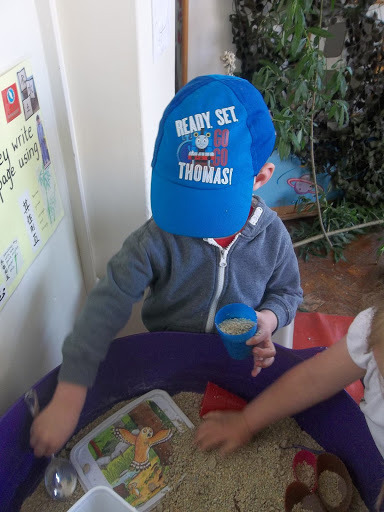 We decorated eggs, counted eggs, looked at different sized eggs from a tiny zebra finch to a giant ostrich egg, We used egg shell to decorate a Humpty Dumpty puppet and had a wonderful Easter Bonnet parade. We had a visit from the ‘Zoo Lab’. We sat round in a circle while the lady showed us all her animals and talked about each one. She told us about animals sleeping in the winter and waking up in the spring. We went on to focus on the theme of Space. 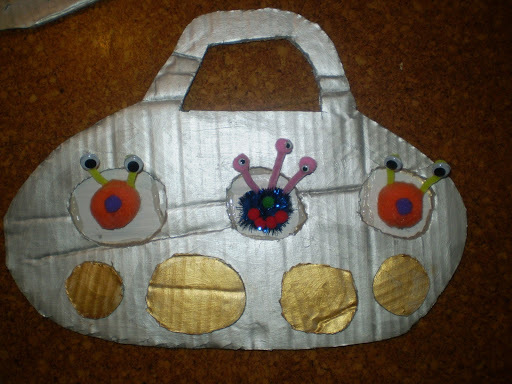 ‘Aliens love underpants’ is a favourite story of the children’s. We made star shaped biscuits, blew paint through straws to make aliens, used salt dough to make space monsters. As astronauts have to get fit to go to space we did an assault course. We also extended our number recognition skills by fishing for numbered stars. 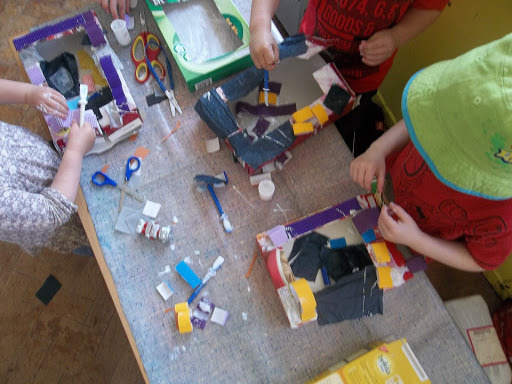 We thought about safety and wearing seat belts and helmets then used boxes to make space helmets. Af ter ‘space’ it was time for the‘Circus’. We practised our circus skills, juggling, throwing and balancing. We drew Clown faces, made Clown biscuits, we drew Clowns, made hand print elephants and sorted circus dogs by size deciding which sized hoop they would fit through. Sarah did magic tricks with her amazing magic colouring book . We talked about our homes and animal’s homes and looked at different types of buildings, including the 3 little pig’s houses. 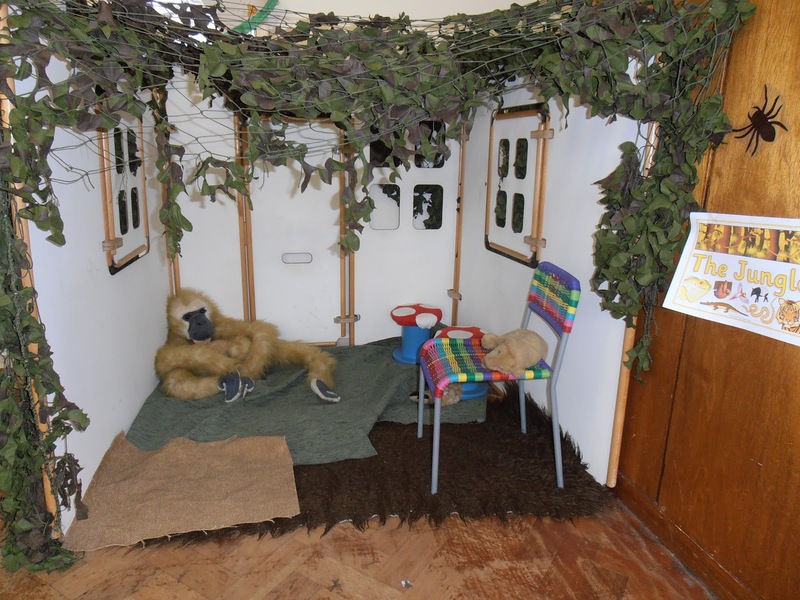 The role play area became an estate agent’s. 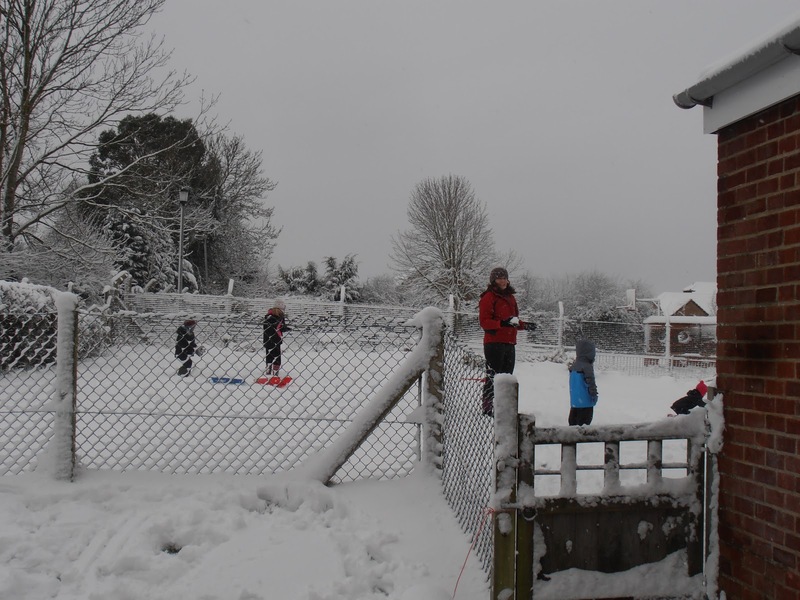 The snow didn’t put us off and staff and children enjoyed playing out in the snow with snowballs, sledges and snowmen. 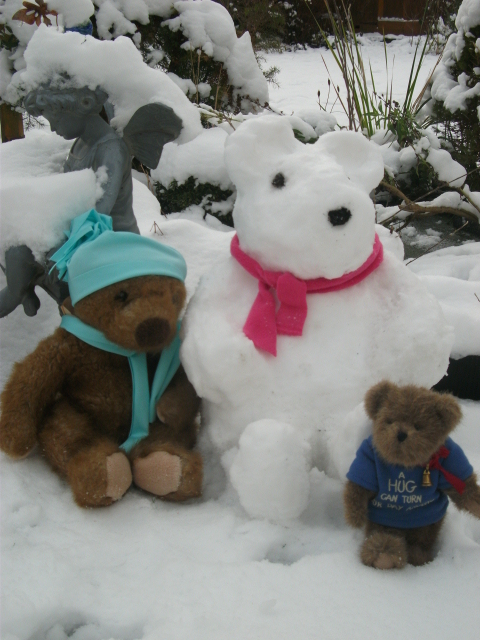 Even the settings favourite bear Ginger had fun in the snow with his freind Neville. 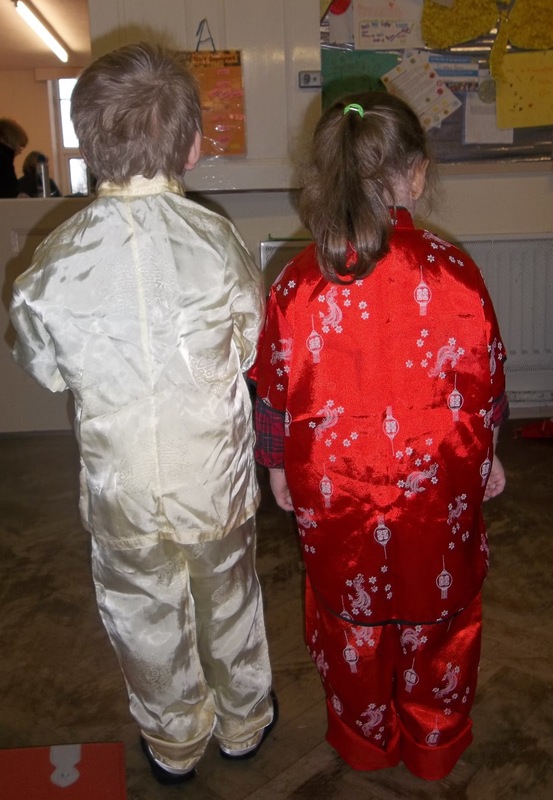 Just before the holiday we celebrated Chinese New Year with noodles, red envelopes and dragon dancing. 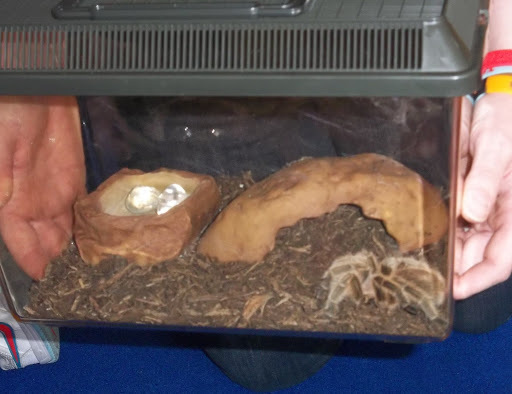 After the summer holidays we welcomed some new arrivals into Daisy Chain and began the year with activities based on Mini Beasts. We made shell rubbings looking at pattern and texture and watched how the snails moved about in the tank. The stick insects visited, then the children used sticks to create thier own insect. We used our number skills to count how many spots we printed on our potato print ladybirds. Our fine motor skills were used when threading wool to make a paper plate spider’s web and when drawing spirals for snail shells. We enjoyed our usual Christmas festivities and visits. 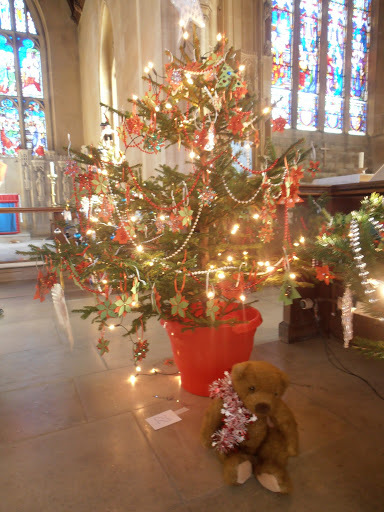 We went to decorate our Daisy Chain Christmas Tree at All Saint’s Church in Westbury and trips to Westbury Infant school to watch their Nativity plays. The Christmas Party was a great success the children loved the childrens entertainer Dave Hickory and the visit from Father Christmas. 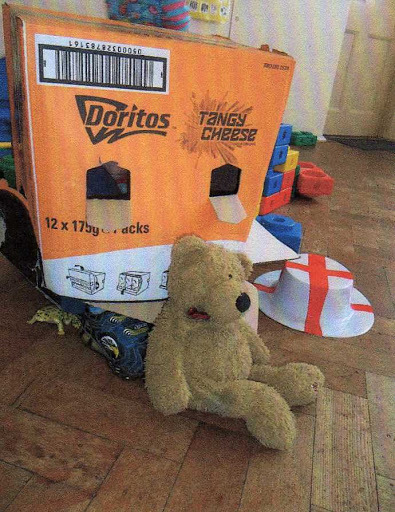 During June the children enjoyed lots of activities based on The Queen’s Diamond Jubilee. We decided to run the activities after the event so that the children would be stimulated to talk about their experiences and htings they had seen on television. 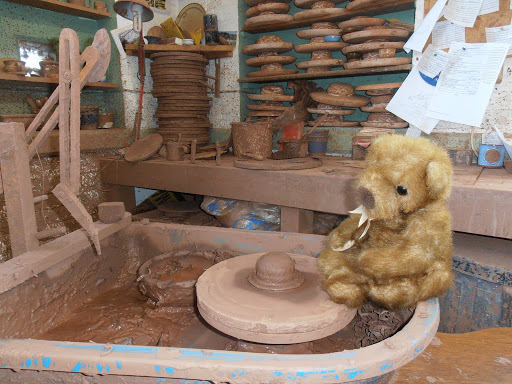 We made crowns, royal barges, flags and our dear old Ginger Bear visited the White Horse Pottery in New town, Westbury to see how Mr Newing made our Jubilee cups. 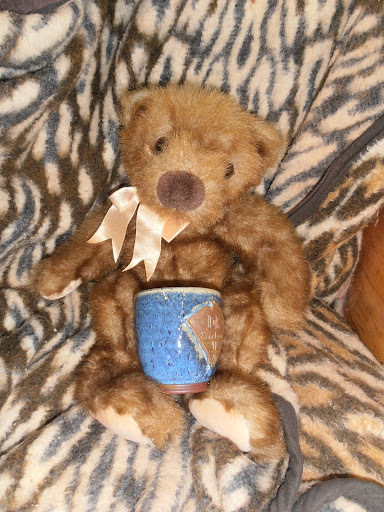 Every child attending at that time was presented with one of these cups. 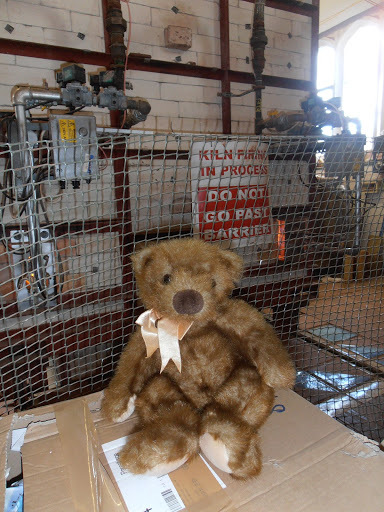 We also enjoyed having Dads, Grandads and uncles visit the setting as part of our Father’s day event . The children loved having them stay and play and the adults found it a valuble experience a window on their child’s world. Parents are welcomed to ‘Stay and Play’ at any time it doesn’t just have to be during an event. Just ask a member of staff. July was a busy month as our rising fives prepared for their next big adventure…… Big School. Reception teachers visited and shared the children’s Learning Journals. 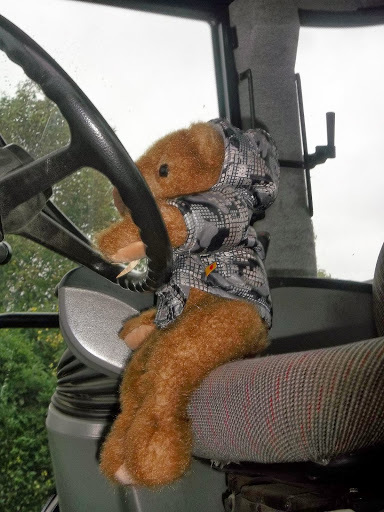 This helped them get to know each child before their school visit. After the Easter break we began working through a set of activities initiated by the Speech and Language Therapy Service. It is known as BLAST Boosting, Language Auditory Skills and Talking. This is a 6 week course of daily activities introducing children to verbs, concepts (size/colour), turn taking, listening and waiting. It was very interesting watching the children as we worked through the daily tasks in small groups. Some gained in confidence as the weeks went on, initially being reluctant to talk but joining in confidently as time went by. Those whose speech was clear and confident were some times impatient and it was good for them to learn to take their turn and wait quietly inbetween, not jumping in when it was someone else’s turn to speak. 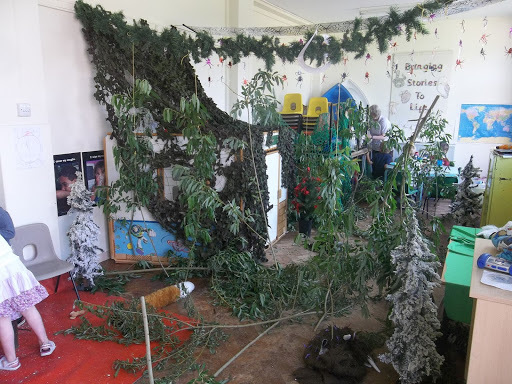 While these activities were going on we tried some new ideas in the role play area, A castle theme, emergency services head quarters, chocolate factory and jungle camp. We also had a visit from some stick insects Mr Big and Mr Tiny! We enjoyed lots of Easter and egg themed activities in March. We made Easter cards for our families and practised out counting skills and compare how many were in groups of eggs as we made chocolate nest cakes and counted out mini eggs to go on top. Hot cross buns for snack were the order of the day. 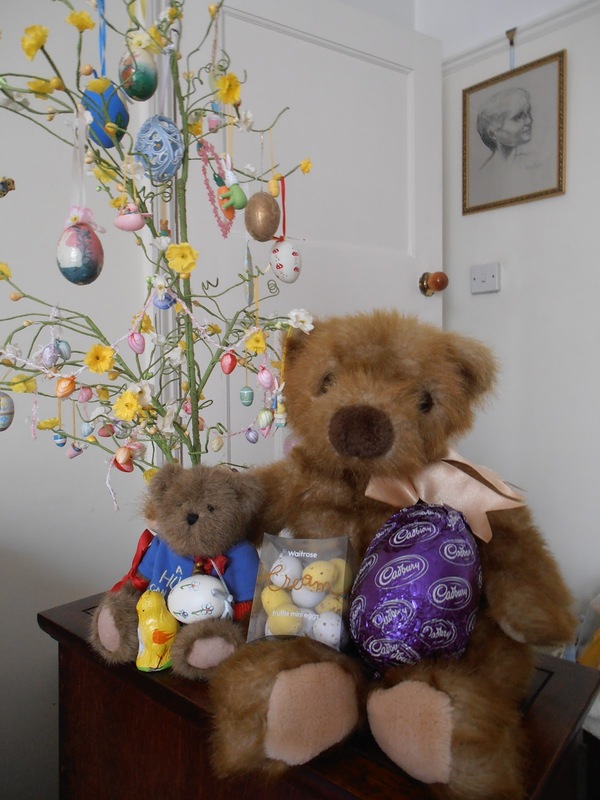 We helped the Easter Rabbit deliver the correct number of Easter eggs to the residents of the Dolls House. Chick world made an appearance, the children enjoyed the small world role play with the fluffy yellow chicks. 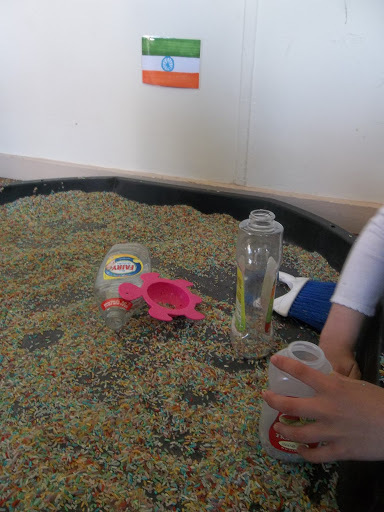 The children were shown a selection of eggs form a tiny zebra finch to the giant ostrich egg and then they practised their cutting skills cutting out egg shapes and gluing egg shell on them. 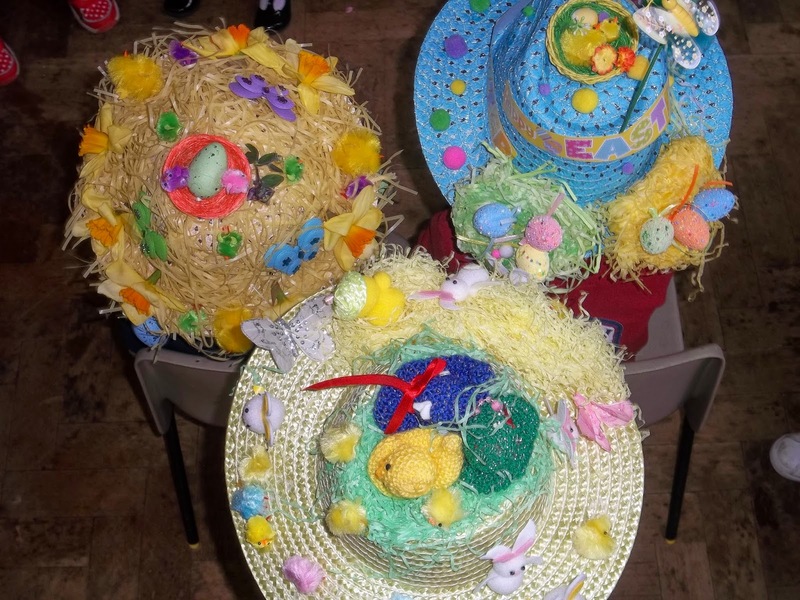 At the end of term we had our Easter Bonnet Parade and mini fete. The bonnets were amazing and everyone was different.